Olympiacos F.C. is the greatest football club in Greece, with the most titles, having won 44 championships and 27 cups and it has always held a special place in Evangelos' heart. For him, the club signifies a number of different, powerful ideas: respect, friendship, passion, pride, victory, grace, solidarity, leadership, fair play, social responsibility and an unyielding belief in the destiny of the most successful and storied team in the history of Greek football. In his own mind, Evangelos Marinakis always has been and always will be, first and foremost a fan of the team and a member of the Olympiacos family. In 2010, he made the decision to acquire a majority shareholding of the club. Evangelos did this because of his love of Olympiacos. Since then, Olympiacos FC has won seven consecutive league championship titles and three Greek cups marking one of the most successful periods ever in the Club's history. The team is ranked by UEFA among the top 25 in Europe and participates each year in the top club competition, the UEFA Champions League. Between 2010 and 2011, Evangelos was chairman of the Superleague, as well as vice president of the Greek Football Federation. Evangelos' decision to expand the Olympiacos Academy of Football and the Football Schools and to invest in one of the most contemporary sports facilities in Europe, has allowed thousands of Greek children to become better athletes, better students and to develop strong values and discipline. Under his leadership, during the period 2010-2017, Olympiacos' amateur teams have won 61 titles in Greece and 5 European trophies across numerous team sports including: women's and men's volleyball, women's polo, women's basketball, handball. Also the Club won hundreds of championships in individual sports: swimming, athletics, sailing, rowing, canoeing, kayaking, ping pong, fencing, boxing, kickboxing, and taekwondo. 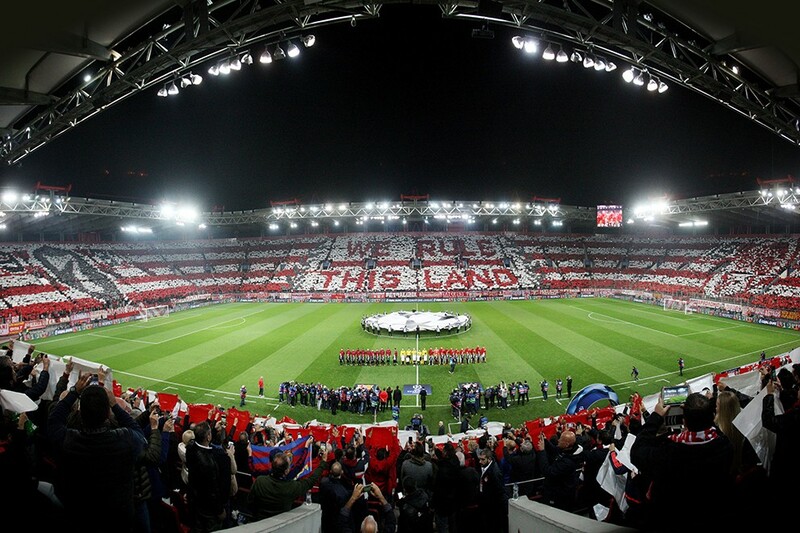 This success, in fact, makes Olympiacos the largest multisport club in Europe. Moreover, Evangelos has guided Olympiacos to develop an extensive programme of socially responsible outreach across Greece and abroad, demonstrating in practice that giving is a way of life. In 2013, during his Presidency, Olympiacos announced a major international partnership with UNICEF, financing the ‘100% Campaign’, the most important vaccination initiative for children across the world. In 2017 the ground-breaking partnership of Olympiacos with UNICEF was renewed. Since 2016, Evangelos has supported Harvard University's work on the Right to Participate in Sports without discrimination, which has an international dimension. In September 2017, he sponsored a special conference in Athens in collaboration with Harvard to focus on football's social responsibility with specific reference to refugees: It was called "Reinforcing, Crossing, and Transcending Borders: Soccer in a Globalized World." At the conference, Olympiacos became the first club to sign the "Athens Principle for the Right to Participate in Sport". Evangelos commented: "Football can cross borders, overcome ancient enmities and bring millions of people together around the world." Olympiacos' initiative has found supporters in the form of fellow football clubs Barcelona, Sporting Lisbon, Juventus, Fenerbahce, Real Madrid, as well as International Sports Press Association (AIPS) and Euroleague, which have since co-signed the "Athens Principle". Between May 31 – June 2, 2018, Harvard University organized the third conference with the support of Olympiacos FC and Mr. Evangelos Marinakis, with the participation of scholars from universities across the five continents! It was well attended by students, club representatives, federations, football and sports people in general. Evangelos is also involved in the large, global, issue of refugees. At his direct instruction, the Olympiacos team made an unprecedented humanitarian intervention. From March 4, 2016 and for two months, until state assistance took over, Olympiacos provided food, water, clothing and footwear to the refugees who were stranded at the gates of the Port of Piraeus. More than 70,000 meals were distributed along with 150,000 items of clothing and toys. Beginning in 2014, and with a commitment stretching over 10 years, Evangelos and Olympiacos have been the main sponsors of a museum in Heraklion, Crete dedicated to the greatest and most translated Greek author: Nikos Kazantzakis. Their contributions help support day-to-day activities and also events organized by the Museum, such as: the annual summer festivals of the Museum, which focus on the travel writings of Kazantzakis e.g. "Traveling in Spain" and "Traveling in England". To celebrate 60 years since his death, in October and December 2017, a concert, a visual exhibition inspired by Kazantzakis and an exhibition of his works took place with Evangelos' support, at the Municipal Theater and the Municipal Art Gallery of Piraeus. Finally, Evangelos supports a new documentary about Kazantzakis produced by ΕλCulture and Cosmote History TV. Under the guidance of Evangelos, the Administration of the Academy and the Schools of Olympiacos implemented a significant charity work for institutions and entities in need. Through the project "Together in Life - Together in Olympiacos!" pupils with cognitive disabilities from Special Schools of Piraeus train at the Academy of Olympiacos, participate in special football tournaments and watch games at the 'G.Karaiskakis' stadium. The program has emerged as an example of European Best Practice in Ulster University's "The Engagement of Disabled People in European Football - Best Practice Cases" conducted for UEFA. In the context of the European Football Week - Special Olympics, Olympiacos and Special Olympics Hellas organized, for two consecutive years in 2017 and 2018, at the Club’s Training Center a 7vs7 Special Football Tournament for Unified Games with the participation of players from the Academy. The special team of the Olympiacos Academy, “Together in Life, Together in Olympiacos” participated in the tournaments. The collaboration with Special Olympics Hellas continues. In order to champion the Olympic ideals of fair play and sportsmanship that are close to his heart, Evangelos as sole sponsor, financed for two academic years the MA in “Olympic Studies” of the International Olympic Academy, attended by 60 students. Evangelos also supported financially the peace education initiative of Greece’s National Olympic Academy, which won a Guinness award in 2012, for enlisting 50,000 children to form with paper ships the largest peace pigeon in the world. In 2013, Evangelos made a substantial donation to the Steven Gerrard Foundation, a high profile charity organization connected to the former England and Liverpool star, which focuses on disadvantaged children as well as those suffering with serious diseases. Annually since 2010, Evangelos and Olympiacos support morally and financially the Association of Friends of Children with Cancer "Elpida". Every year since 2013, Olympiacos keeps the flame alive for some very special people, children with neoplastic disease, hosted in "Floga", the Association of parents of children with neoplastic disease. Evangelos, through Olympiacos FC, donated the amount of €75,000 in memory of his father, Miltiadis Marinakis, to the Association for Patients with Hearts Diseases of Northern Greece "Children's Hearts" for the purchase of equipment for the Clinic of Adult Congenital Heart Defects of AHEPA Hospital's First Cardiology Department. The clinic provides care to around 600 patients and, with this donation, it is possible to make the diagnosis and monitoring in Thessaloniki. This way, parents and children will not have to travel to Athens for examinations. In June 2012 through the non-governmental organization (NGO) Greece Debt Free, Evangelos bought and retired €1,364,000 face value of Greek debt, spending an actual €168,590 on behalf of the 55 players and employees of Olympiacos FC. Εvangelos also supported the reconstruction effort in Japan following the devastating tsunami of 2011. Olympiacos was the first international football club to reach out to representatives of Japan, inviting the Japanese Ambassador in Greece to a special event where he received a cheque from the club towards disaster relief efforts. Olympiacos and the United Nations Development Program (UNDP) organized in December 2010 the 8th Match against Poverty with football legends Zinedine Zidane and Ronaldo at the 'G.Karaiskaki' Stadium. The proceeds of the match were donated to help earthquake-stricken Haiti and Pakistan.